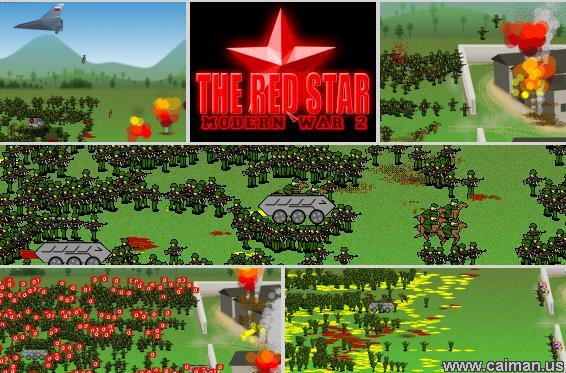 Caiman free games: Modern War 2: The Red Star by Anubis. 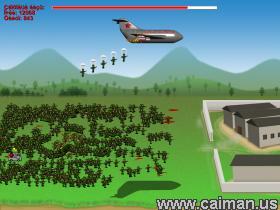 Hundreds, no, THOUSANDS of soldiers are attacking your base. Soldiers here, soldiers there, soldiers everywhere! Foot-soldiers, full-tracks, cavalrymen, planes, parachutists, etc. It never stops! Just shoot them down, shoot them ALL down!!! It's war! Don't let them take over your base. Fight till your last man! The first time I played this game I thought that I was fighting against the Zulu's. The more enemies you kill, the more new ones will appear. But don't worry, if you can stand long enough, they will give up and you will win the big battle. Not only you can shoot them (with the left mouse), but you can buy items too. Right mouse click will open a nice menu, and you can choose what you want to buy. 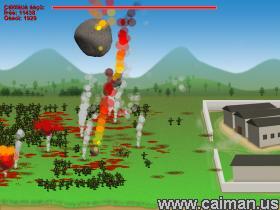 You have a choice of soldiers, a tank, a plane or even a meteor storm. In this game you have to try to get a high score. The more you kill, the more points you get. But if you buy an item, you will lose some points. It is your choice.